As it may have been mentioned before, the Super Nintendo and Sega Genesis days were the heyday of role playing games. Plenty of milestones have come along since, but so many games from the 16-bit era had quality, immersion, and charm that it’s hard to debate how great and influential those games really were. Between the well-known series that were dominating attention at the time like Final Fantasy, there were other games eking their way into their shadows, falling into a obscure nostalgia years later. For me, Arcana has always been one of those games. It was one of the first role-playing games I ever played, and I decided that going back to see what the game was like beyond the first dungeon would be a fun endeavor. In the world of Elemen, the people were living under the tyranny of Empress Rimsala. However, a group of wizards called Card Masters used their power to seal her away and bring the world peace. After some time, though, strife begins to come around thanks to Galneon, the former court magician for the king of Lexford, one of Elemen’s kingdoms. He manages to have all of the Card Masters killed and brings terror to the wo rld to revive Empress Rimsala. The story picks up ten years later, where you take up the role of Rooks, the last surviving Card Master and son of the hero Falas, who fought against Galneon and was killed. His best friend, Ariel, comes to the village to tell him that Galneon has been taking action to revive Rimsala, and Rooks takes up arms to stop the resurrection, as his role of Card Master dictates. The game plays out in five chapters, each containing a unique dungeon or series of dungeons to travel through on Rooks’ quest. Your party will consist of four characters, including Rooks, at the most. One of these is an Elemental Spirit in contract with Rooks. While this party slot is constant, you gain access to four Elemental Spirits (Fire, Water, Earth, and Wind, classically) who will fight alongside you, cast spells of their attribute, and impair the enemy’s abilities or bolster your parties. Unlike your other party members, they also regain HP and MP as you walk, making them somewhat of a strategic renewable resource for battle. The other two slots can be filled by one of four characters you run into throughout your adventure, including Teefa, Ariel’s apprentice, Salah, one of two missing daughters of the King of Lexford, Axs, her bodyguard and former Lexford Knight, and Darwin, a mysterious elf in search of something. They weave in and out of your party as the story necessitates, but they are never under leveled or a hindrance as a result. The characters tend not to fall outside of their roles in the narrative so far as personality is concerned, but they still have some characters thanks to great sprite work with their portraits and throughout the game. L ike many dungeon crawlers of the time, the pace of the game is slow at first, and leveling early in the game helps ease the high difficulty throughout. Grinding is definitely the name of the game, as leveling up and buying equipment is vital to continuing throughout the game. As you go through the game, each chapter presents its own dungeons- and no way to travel back to previous dungeons. This makes exploration important, which facilitates the experience building that you need. Once you have reliable ways to retreat back to the town of the chapter and regroup, you will find yourself reliving a lot of your exploration, which is thankfully made easier due to the map that builds as you explore in one of your pause screens. The game is actually much more accessible than many other games of its genre and time. The most fun and charming part of the whole game, though, is the story. As it unravels, there are a lot of clichés and tropes that you may have seen in many games, and while they may have been done better in other titles, the game takes itself just seriously enough to give a good reflection of the era in gaming. Some elements like the card theme in battle and cutscenes, and some of the almost nonsensical dialogue retain the feeling that games of that time had. Of course, much of the difficulty comes from some elements of the game that could have easily been rectified, though they are not altogether terrible. For one, none of your human characters can be killed or it’s game over. This is a deviation from a lot of games of the time, and not something incredibly expected when going back to play it now. Your Elemental Spirits can be killed, resulting in a torn card in their place on your character screen, which is a neat effect, but you need to take care of the rest of your party intensively. Also, nearly all of the bosses in the game appear at random intervals throughout your travels, having little to no warning before appearing to decimate your oft-times unprepared party. All of this can be easily fixed by getting your characters strong and well-equipped, but it does become an exercise in patience after a time. It doesn’t help, however, that some of these bosses are shoehorned plot devices that come from left field, as well. The music is good, rarely falling into the offensive or brilliant. The sound quality of the whole game is well done, and HAL is not unfamiliar to pleasant sights and sounds, having been behind many other popular games like the Kirby series and Earthbound. The sprite work is pretty great, too, from the character faces to the handling of characters and their actions. Both of these are fairly limited, though, as there is not much in the way of music needed for the game, and most of the monster sprites throughout the dungeons tend to be the same five or six recycled palette swaps. As is sometimes the case with other dungeon crawlers, as well, the environments you travel through tend to get somewhat monotonous but never ugly or dull. Arcana is a classic without really being one. It is pure fantasy- elves, dwarves, magic, and all- and it has just enough plot to stay interesting. The game doesn’t overstay its welcome, as even with grinding, it probably took a total of 25 or so hours to complete. 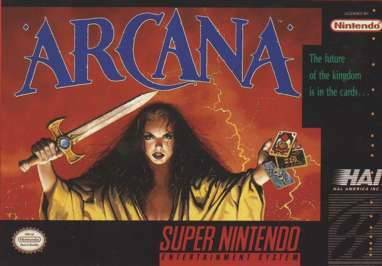 So far as retro RPGs, if you are looking for something off the beaten path, you could do a lot worse than Arcana. It does a great job of making you feel like you’re progressing when sometimes, you’ve only reached the second floor.